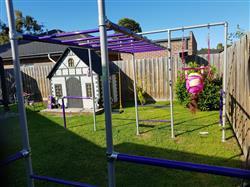 The double swing frame can be added to any our monkey bars to enable you to create two additional play stations. From the double swing frame you can choose two accessories to hang including swings, trapeze or cargo nets. Accessories can be swapped in and out to keep the kids amused. The unique design maintains its stability with the positioning of the twirly-whirly bars. The double swing frame is powder-coated silver. Note: swing frames do not include swing hooks. Call us on 1300 912 198 to order. Look, I'm not equipped with the muscles to manage a work out on these incredible beasts buuuutttt... my kids are incredible on this thing. It's the best. Amazing. Excellent company! I would strongly recommend ordering from this company. My experience with them was absolutely amazing. 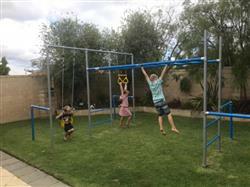 The Grandkids love their new addition to Grandmas backyard playground. Top quality! Very easy to assemble especially with the videos they supply. I believe the set will still be around when they outgrow it and they are petite 7 and 10 year olds. Perfect addition to the Original! 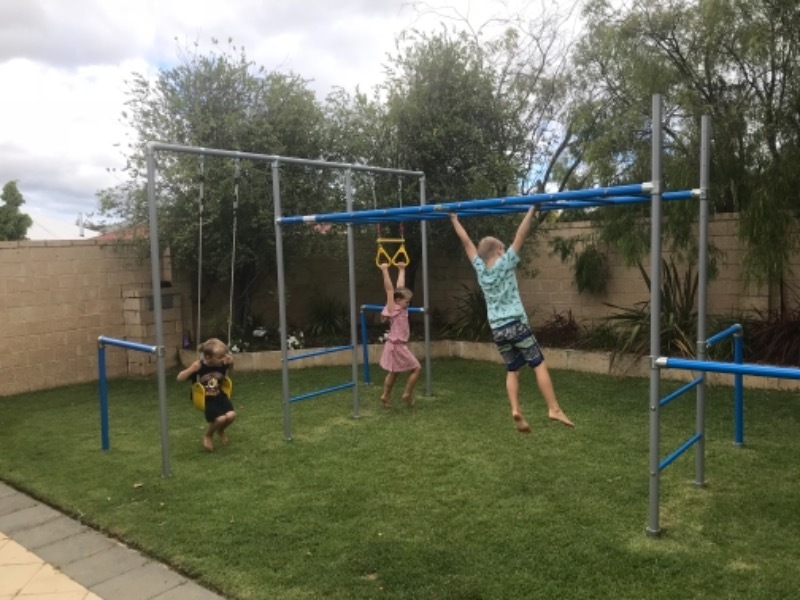 The double swing frame is a perfect addition to the Original Funky Monkey bars, we hang a swing on one side anda trapeze on the other, something to keep all the kids busy! Thanks for asking for feedback - have been meaning to ring and say thank you. This was an upgrade to our existing chimp and the guy who came was terrific, fixing up my dodgy installation, adding the new frame and flying fox and even sanding back and touching up damaged poles. Fabulous service, much appreciated.